Being under the weather isn’t keeping workers out of the office, new research from staffing firm OfficeTeam shows. 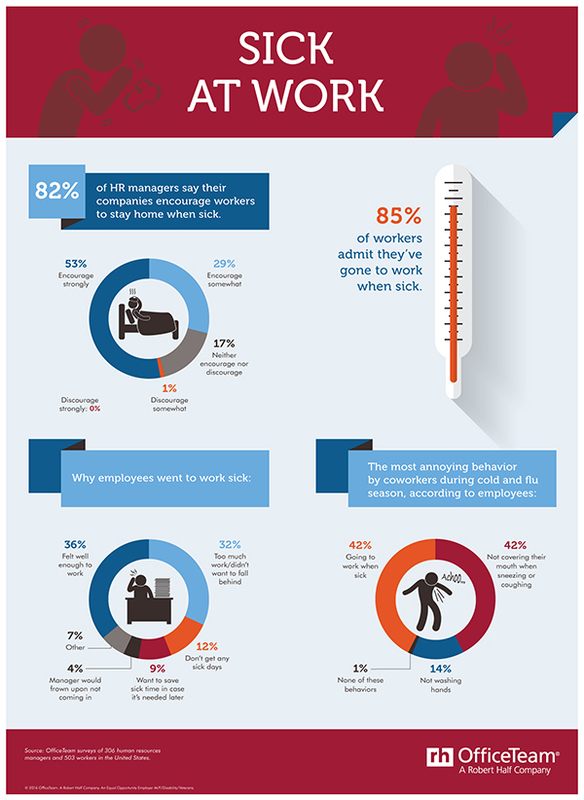 While 82% of HR managers interviewed said their company encourages staff to stay home when they’re sick, 85% of employees have gone to the office anyway. Thirty-six percent of those who showed up to work while ill did so because they felt well enough to do their jobs; another 32% didn’t want to fall behind on assignments. But coworkers are not pleased: 42% of employees surveyed said their biggest pet peeve during cold and flu season is when someone comes in sick. Another 42% are most annoyed when those around them don’t cover their mouth when sneezing or coughing. “Managers should set an example by steering clear of the office while sick and encourage their teams to do the same,” added Britton. Check your options. If you’re feeling well enough to complete projects but are still contagious, find out if you can work from home. If telecommuting is not an option or you’re feeling too ill to tackle assignments, work with your manager to identify team members or hire temporary professionals to help during your absence. Be a good neighbor. If you absolutely must be at work due to a major deadline or meeting, avoid getting too close to others, wash your hands frequently, and cover your mouth when sneezing or coughing. Try to leave the office after the critical task is completed. Lend a hand. Offer to fill in for coworkers when they’re out sick. It’s likely they’ll return the favor the next time you need help. The infographic below highlights more key findings from this survey. To learn more, visit the Office Team website.